Rodale Institute no-till research, Kutztown, PA. Rotational No-till and Mulching Systems for Organic Vegetable Farms Webinar with Jan-Hendrik Cropp, hosted by the Extension Service. Singing Frogs Farm, a no-till small-scale, mixed vegetable farm doing good things in California. 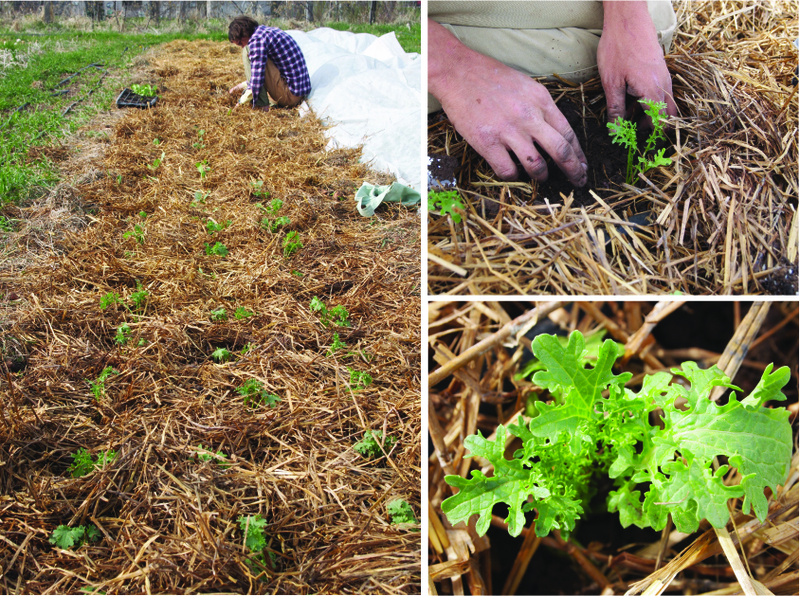 No-Till Certified Organic Vegetable Production, a MOFGA article by Jean English of Four Winds Farm. Prairie Road Organics, our neighbors in North Dakota, and this great video. No-till vegetables: harnessing the power of cover crops. A project from University of Maryland, funded by Northeast SARE. Tillage breaks up soil structure and disrupts dynamic soil ecology. Based on our partial understanding of soil health, of biological and nutrient cycling, we were predisposed to prioritize and nurture our soil. The health and longevity of our farm system and quality of our food is absolutely reliant on -and is a direct reflection of- our soil health. Having backgrounds in environmental science, we both came to farming via an interest in land health. Although we were convinced of no-till by the book and in our guts, we had no actual hands-on experience growing crops this way. One of our goals is to minimize off-farm inputs (in terms of fuel, fertility, plastic farm garbage, etc), we’re able to pursue this goal through managing our soil nutrients through a no-till system, using cover crops and crop rotation, hand and bicycle power. We have employed a creative, varied suite of techniques and a veritable rainbow of mulches over the past three years. We established locations for our permanent beds using a sod cutter. Each 30” row was cut in 2 passes, with an 18” sod cutter blade. The sod cutter blade was set at 1-1.5” depth, trying to cut below the sod and roots, while having minimal amount of soil disturbance. In retrospect, we should have gone deeper as we missed some of the perennial root mat. Glazing of the soil from the sod cutter was noticeable during the first year, limiting some transplant root growth, but by the start of our second year this had been broken down, worked in by worms. After cutting, we manually flipped the sod. Our thought here was that the flipped sod would die out; exposed roots would break down, making a great cleared area to transplant and seed. This worked better in some places than others. It did not work in areas where the grass growing is rhizomatous/perennial and where we have bindweed. We used the sod cutter to prepare beds early during the spring we moved to the farm. Ideally, we would have prepared these beds during the fall before our first growing season, using heavy mulch and not fussing with the sod cutter. We mulch liberally. So far we’ve used: newspapers, barley bags from the brewery down the street (triple-ply paper bags, the same width as our walkways; work great, break down within a year), a roll of craft paper (100% recycled, unbleached 36” wide; fancy red-carpet effect, but breaks down almost immediately after first rain), straw mulch (@ $4/bale, 2 bales/bed, > 60 beds, with bonus thistle seed), wood chips, and cover crops. We’ve grown winter rye as a cover crop which worked well to out compete early spring weeds, then laid it down in place as a mulch that we planted winter squash into. This is ultimately the direction we’d like to go with all our mulching – growing it in place as a cover crop. Small-scale, mixed vegetable growers will often use plastic mulch, but this is something we’d like to avoid. The plastic is used for one season and then heads for the landfill. Although effective at reducing weed pressure, it’s biologically a net-negative for soil health as it leaves the farm as waste, rather than adding to soil fertility. Biodegradable plastic mulches are beyond our budget and seem creepy. We use intensive spacing in our plantings and companion planting in order to help out-complete weeds. And hand weeding. We spend a discouraging amount of time hand weeding perennial weeds (grasses). This method seems to be the most efficient at getting rid of the persistant roots. In some beds, we have used a hoe to break up clumps of sod, followed by hand weeding. This is laborious and results in more soil disturbance than we would like. This year we finally invested in a broadfork; it works infinitely better than a heavy peasant hoe, with less disturbance and better root removal. We had procrastinated in getting one for three years because they are mega expensive, but we’ve had this for a week now, and it’s completely worth it. Tangentially, but pertinent: we irrigate our beds using gravity-fed drip tape, with water from the Evans-Tonn ditch off of Spearfish Creek. The tape should need replaced every 5-7 years. We have over-wintered the tape on the beds in the field, under mulch. So far, this is working well. A problem we’re running into is calcium build-up at the emitters from hard creek water. 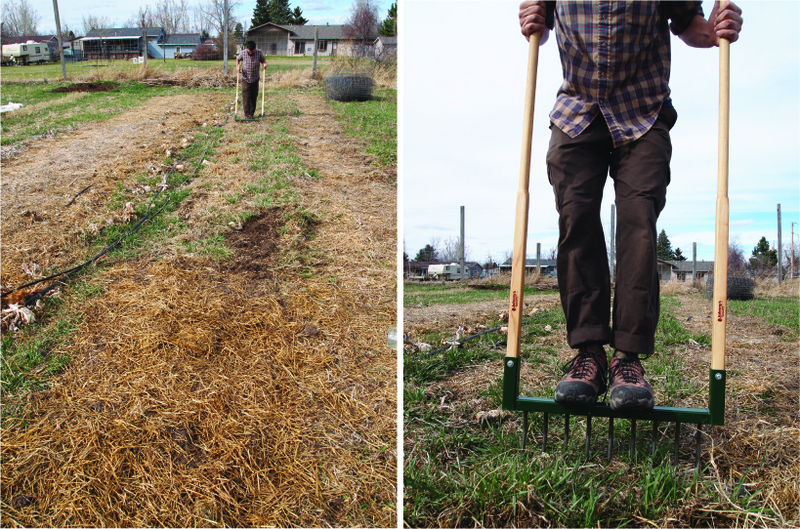 Effective mulching inhibits early spring soil temperatures from warming up. As mentioned, our biggest weed pressure is from bindweed and smooth brome. We have let early spring dandelions go for the bees and, as a result, some beds have substantial dandelion pressure (but great dynamic accumulators). Good intentions, poor foresight. Heavily mulched no-till beds, as it turns out, are absolutely irresistible forage and habitat for gophers. The amount of time it takes to prepare the beds, individually and by hand, each spring has been a big challenge. We have found limitations in direct seeding the beds. Also, claiming the aisles between the beds has been hard, it is currently smooth brome dominated, but we would like to replace this with a low laying resilient ground cover (i.e. white clover). We have very little trouble with annual weeds. Our third year in, we were able to direct seed carrots into certain beds, we even used an Earthway seeder. Progressively, each year, bed prep time is decreasing and weeding, transplanting, and seeding are getting easier. The soil biology is thriving: so many earthworms, spring tails, and other invertebrates. It’s positively distracting. The soil structure and moisture capacity is awesome – no ponding water, ever. Rarely is it too wet for us to get in the field to work. And, with the heavy mulching (and weeds), we infrequently have bare, exposed soil. In the future, we would like to pursue more attempts with cover crops, part of this is getting them written into the crop plan and calendar. We need to establish routine monitoring with soil tests. And continue with proven ninja tactics: persistent mulching and proactive hand weeding. As soil health improves and soil biology becomes more active, mulch decomposes/ breaks down at faster rates, so we’ll need to figure out how and at what rate to lay down new organic matter/mulch and where to source it from. Soil amendments so far have included compost applications (our own vegetable compost and composted dairy manure), compost tea, and biodynamic preparations (BD 500 and barrel compost). We’ve used cover crops primarily as weed suppression and mulch and would like to do more with them utilizing soil building capacity. Buckwheat, clovers, sorghum, and field peas are things we look forward to incorporating into our cover crop rotation in the future. We have a brassica heavy crop list and finding a spot to include a brassica cover crop (radishes) is going to be tricky. As part of our monitoring, we would like to figure out a way to measure and track how much carbon we are sequestering in the soil. We can get a rough estimate of this by looking at soil organic matter percentages over time. And then, ultimately, we’d like to be able to compare this to the carbon budget of the whole farm. Through experimenting, we have learned and will keep learning an enormous amount. Overall, we’re happy with the results we’ve found and the direction we’re headed. We would really love to hear other no-till tales, suggestions, criticisms – please be in touch. Since posting this, we have been asked questions about the walking crimper. Here are some notes from Jeremy: There is a photo of our crimper – angle iron on a 2×4 with rope loop handle. It did not work exceptionally well for us but I think it was more construction flaws than concept. Most of our aisles are built up from mulching. When I built the crimper I sized it to do the whole row in one pass, this meant the edges crimped well but too little pressure was applied into the lower centers of the bed and we had a lot of the rye pop back up. We ended up going back in and pulling the rows by hand. The crimper was a joy to use, easy rhythm, not fatiguing. The piece of angled metal we had on hand (some shelving bracket) was not strong enough and by the end of 500′ the edges taking the pressure had flattened to nearly useless, I think a stout piece of angle iron would probably hold up better. This entry was posted in farm update and tagged covercrops, no-till, no-till vegetable bed preparations by Cycle Farm. Bookmark the permalink.